Turn your computer with LucidControl Plug & Play IO Modules within minutes to a powerful data acquisition, monitoring and control system. Ready for many automation applications. Measure temperatures, control your home, garden or caravan with the outstanding LucidControl IO devices. 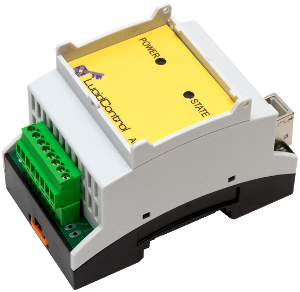 LucidControl is compatible with the Raspberry Pi® and Beagle Bone Black which maximizes the number of possible applications. 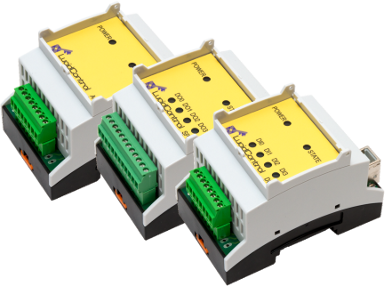 LucidControl USB IO Modules is the unique product series for monitoring and controlling analog and digital signals. The Plug-and-Play USB DIO modules operate with Windows and Linux and they are compatible with the popular Raspberry Pi and Beaglebone computers. For an easy integration a command line tool is provided as well as Java and Python API. An API for .NET is available, too. The USB Digital Output Modules are ready for various tasks. By using Solid State Relay outputs the devices can drive motors, pumps, fans, heating elements, etc. The energy provided to the power load can be controlled by a pulse width modulation (PWM) which allows to switch power loads for a specified time on and off which is a very convenient method for controlling e.g. pumps or fans. Since Solid State Relays provide a very high insulation the hardware is strongly protected. For light control a open collector option enables e.g. dimming of modern LED lights. For these kind of application the same PWM function is used but the speed of switching is much higher in order to avoid flickering of the LEDs. Finally, mechanical SPDT Relays complete the output functionality of the USB DIO modules. This allows switching of power loads as well as analog or digital signals. By employing mechanical relays, signals can be switched and toggled without distortion. The input functionality of the USB Digital Input Output Modules allows reading of digital level signals where voltages of 5V, 10V, and 24V are supported. Beside of general purpose static signals the USB DIO Modules provide also counting, edge detection and timer measurement capabilities as well as an integrated debounce function of the digital input signal. The USB Digital Input Module is the acquisition and monitoring solution for 4 or 8 digital lines. All input lines of the USB Digital Input Module are carried out optical and potential insulated in order to protect the hardware and give higher flexibility in design. The USB Digital Input Module is available for 3 different threshold input voltages of the ranges 5V, 10V and 24V in order to interface many different devices directly without conversion of input levels. Reflect Mode Sampling a digital input signal and provide its conditioned and debounced state. Edge Detection Mode High speed Sampling of digital inputs and detecting rising or falling edges in real-time. Count Mode High speed Counter for various signals providing different options in order to evaluate a wide range of pulses and sensors. Filters can be applied to each input channel in order to suppress erroneous signal states. Ensures signal detection without activity of the host computer which is crucial in order to ensure precise timing. All LucidControl USB IO Modules are available with galvanic USB isolation. Contact us for more information. All LucidControl are power supplied by USB and do not need additional power supply. The housing of LucidControl can be directly mounted on Din-rails ready for switch board assembly. Using industrial standard IO connectors ensures reliable interconnection. 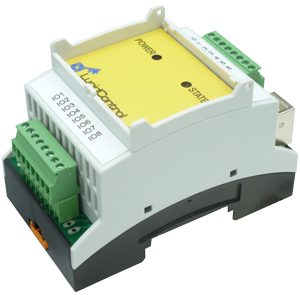 LucidControl modules are easy to install and start working immediately after set up. The IO Modules are compatible with Windows, Linux, Raspberry Pi and Beagle Bone LucidControl provides drivers for all major operating systems. Command line tools and APIs for Windows and Linux are available. The API is compatible with .NET, Java and Python. 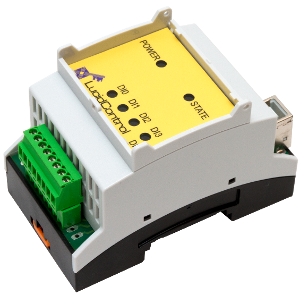 LucidControl product series combines many advantages and change a computer into a data acquisition and control system.